As usual we held our weekly demo. It was well attended by people from the local area, all with the common belief that it is wrong to make people suffer in the way that the DWP do. The claimants are not to blame for their poverty, its very easy to fall upon hard times, but extremely hard to climb out of poverty. Every attempt is thwarted with yet another obstacle given to them by the DWP. Its started to become cold now and therefore it gets harder for the claimants and ourselves. Heat or eat is a choice that has to be made and eat usually becomes the only option, that’s if they can afford to. I’m sure that many claimants and working poor claiming Universal Credit have sleepless nights worrying about how they are going to feed their families and themselves. I know that feeling well. It’s a horrible feeling and the government has no right whatsoever to punish the poor for their own poverty, whilst they languish in comfort, it’s a totally different world. 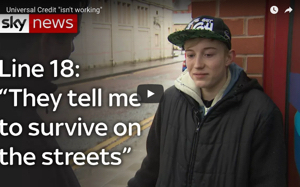 I spoke to a lady who was sent outside the Jobcentre for being ten minutes early. Now before anyone says that this happens all the time, I know it does, Ive been writing about it for two years now. But it always reminds me of the mind games that the DWP like to play. They like to keep control, a bit like an abusive partner. I know that there is room for the claimants to wait, but the G4S security guards turn them away. I inform claimants that they should wait in the lobby but most are too scared to do so. Claimants are terrified of the DWP and with good reason. The DWP in effect controls their life, where their next meal will come from and basically everything that they do. I also noticed a few claimants runnning towards the Jobcentre, scared of being late. Your cannot be even five or ten minutes late. That will most likely result in a sanction which will take away most of their income. The DWP give no allowances at all, compassion is a quality that they are devoid of. A woman rushed into the Jobcentre, she was very upset and panicking. “They’ve stopped my money, it wasn’t in the bank. I don’t know what I’m going to do.” She went on to say that she hadn’t received any notification either. This isn’t unusual, and I’m sure its not done by mistake. Call me a cynic but mistakes like this don’t continually occur fo three years. Everything is calculated carefully to ensure that a claimant remembers their place, so they are compliant, so they don’t argue back. A compliant society is very easy to manipulate and they count on that. I would also like to say that claimants are not living the life of luxury. Anyone that believes this should spend a morning with us. They would be shocked. We helped countless people. I say countless because I don’t keep a tally but maybe I should. We also spoke and gave advice to claimants whom we see on a regular basis. The Jobcentre staff tell them to ignore our advice, but our advice is correct and empowers people to fight back, to take a stand. And it works. We handed out some warm coats, but we are needing to start stocking up for winter. The campaign doesn’t end on a Thursday though. It’s a full time job, and anyone else campaigning like this will tell you the same. Its very hard work, both physically and emotionally. You’ve got to be very strong to undertake it and keep it up. Please donate if you can, it really helps. If you can’t then please share! Thank you! Next Thursday we will be holding a special I, Daniel Blake demonstration to coincide with the official release of the film. Its a fantastic, hard hitting film which touches on some of the issues that we deal with. Please come along if you can. Thursday 10-12. It’s going to be fab.. If everyone who read this blog signed up it would take over Twitter for the day! I also apologise with the delay of writing my blog this week. My health hasn’t been brill and I’m now on antibiotics. I will be feeling bettter soon thanks to our precious NHS. Our short film with The Guardian. 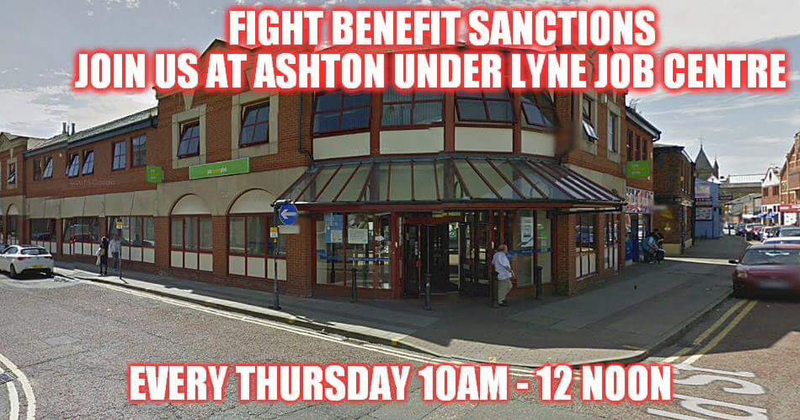 Ashton under Lyne Jobcentre seem to running some sort competition to see how nasty they can be to claimants. It must be like signing-on in Hitler’s bunker with the SS guards standing around. Last week in our local (southwest ) jobcentre, a young man of about 20 rushed in to sign at 9.18 am. He was 18 minutes late, apparently without any particular reason. The advisor just told him mildly, that he was late, and unfortunately as he was more than 10 minutes late, he would have to come back at 4pm. ( They allow 10 minutes leeway, after that you have missed your spot, and have to come back later ). But there was no sanction or threatening behaviour from the advisor. It must be admitted this advisor is one of the nicer ones, and it might have been different if he had been 2 hours late. Again in contrast to Ashton, our local jobcentre has an area where there are terminals you can use for jobsearch, anytime. Including people who have come in early, and are waiting to sign-on. On the walls around the terminals are notices about jobs, and training courses . Which any claimant is at liberty to look at whenever they like, and indeed the jobcentre management encourage them to do so. They call it a Jobzone or something similar. It just goes to show that signing-on itself is operating on a postcode lottery, with some places like Ashton clearly determined to go for maximum toughness with the claimant. Please Add your support to the ThunderClap contained in the original article. Thanks, Mark. Awful just awful but sadly not uncommon. It’s disgusting and inhumane. Always complain straight away to your local MP. If labour it can make a world of difference.